Bouchra Ouizguen and her Compagnie O return to the Walker with a project that will unfold over a week of rehearsal, combining two parts local participants to one part visiting artists. The result, Corbeaux (Crows), is a work that has been recreated in cooperation with local dancers in, among other cities, Brussels, London, Paris, and—most recently—Portland and Cincinnati since its birth in 2014 for the Marrakesh Biennale, where it was performed in the city’s railway station. 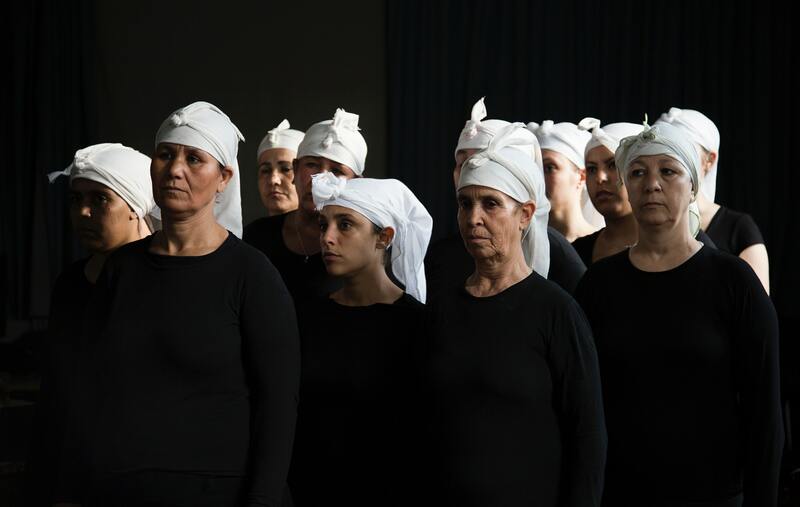 In it, a group of women dressed all in black save for the white cloths tied about their hair stands in geometric formation, swinging their heads forward and back, calling out in sharp and long sounds. The size of the movement and sound build together, drawing in the audience in a way that both references and evokes the affects of the ritual trance practices of the Marrakesh region on which the piece draws. Ouizguen calls Corbeaux “a sound sculpture, raw and urgent” that “flies toward” the public spaces where it is performed. Trained in Morocco and France, and a pioneer in the Moroccan contemporary dance scene, Ouizguen has traveled in European performance circuits since the 1990s, and North American ones for nearly a decade, with works including Ha!, Madame Plaza, and Ottof. I first encountered Ouizguen and members of Compagnie O in 2012 when organizers working on the Chicago segment of the Voices of Strength tour called me in to offer support in Arabic-English interpretation over a week of workshops and performances. Voices of Strength was a mini-festival that presented women choreographers from Africa in a two-evening program that toured six cities across the US, including Minneapolis, where it showed at the Walker. In that program, Ouizguen and three company members performed Madame Plaza, a work which foregrounds the sonic power of the ‘Aita vocal tradition of which these particular performers are a part. Ouizguen has worked consistently—and across many levels—with translation; with this fact come a myriad of small and profound choices regarding how her work is framed. In the instance of presenting Madame Plaza in Minneapolis, for example, a choice must be made as to whether and how to summarize the concept and practice of ‘Aita. Performance traditions do not often lend themselves well to shorthand. Summaries are written, however, and these at best provide an opportunity; at worst, they confirm oversimplified images. As such, some US responses to Ouizguen’s work have followed a pattern well-embedded since the 19th century in which Western viewers interpret elements of movement, sound, and costume as the raw ingredients of a digestible and exotic North African culture distilled via a dancing envoy. In this mode of analysis, the particular interventions of an artist or company tend to be subsumed into a larger set of narratives about the pre-given meaning of place. Some places then are privileged as those from which it is possible to represent universal (Western) truths, while others become realms of fantasy in which to find pleasure in mystery. Here I want to suggest that it is possible to read Ouizguen’s work in a way that allows us both to learn something about the specificity of her and the members of Compagnie O’s (disparate) origins, while simultaneously grappling with questions foregrounded in the composition that exceed national or ethnic frameworks. We might view Corbeaux, in particular, as raising questions that invite a rethinking of the universal and the particular. For example, how might performers’ similar costumes and gestures make more—not less—apparent the subtle complexities of difference? How does an individual’s head and neck move distinctly among many? Or how do we, as viewers and listeners, attempt the impossible task of pinning the timbre of a voice that catches us to a specific performer’s body? Ouizguen describes this work as one that “zooms in” on the face and on the neck. While we witness many bodies, and bodies in their entirety, we might be drawn to the seeming origin of movement in the head and in the neck. We might also strain to listen to these smaller points within the wider scene. What might we see and feel and surmise in this straining? What might this “zooming in” from afar on the face and the neck that Corbeaux suggests offer toward a reconceptualization of the individual in context? In a recent interview about the piece, Ouizguen explains, “For this show there was a decision which was to work not on the rehearsal but on how to feed on what is essential.” The collaborative process through which each city’s dancers encounter the show must certainly unearth a vibrant array of what constitutes “essential.” That is, for each dancer and for each day, the essential —the core and/ or the most necessary—likely differs and shifts. Interestingly, then, while the work might look similar in its various iterations, it contains much more: collections of[the essential ingredients of that particular week in that particular place. These collections may not be apparent visually or verbally in the framed performances, but I suspect must be part of what is felt in witnessing them. 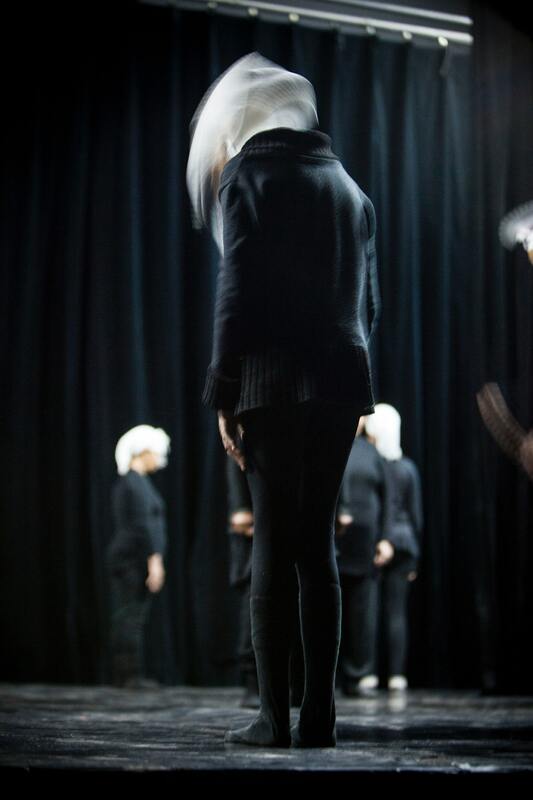 Ouizguen calls her performer-crows “ageless and disparate,” suggesting that they cannot be mapped into a normative chronological progression. Ageless might be read: multifariously aged and aging together in relation. The work, Ouizguen says, “invites above and beyond origin, age, height.” These elements are of course not shed; they enter the rehearsal and performance spaces along with those to whom they are attached. But perhaps the “above and beyond” is produced out of their combination. Perhaps the “invitation” allows the resulting cacophony. Perhaps the wondrous and unique particulars are enfolded into the staging of an encounter. “Corbeaux is one of the shows that enchants me the most,” the choreographer goes on to explain, “because everything remains to be done. That is, even if it has been created, I have the impression each time that there are still things that escape me.” Here, it seems to me, Ouizguen describes the radical quality of vitality. Each iteration of Corbeaux proves anew the impossibility of repetition. Each new formation of performers and what unfolds between them attest to the essential liveliness of the unpredictability involved in any meeting. When “everything remains to be done,” the day might be full of work, but it is also full of possibility. In the way it gathers and builds, Corbeaux might offer something akin to what the anthropologist Lila Abu-Lughod calls an “ethnography of the particular.” Such a method looks not to ethnography—nor, as I am suggesting here, to dance—to provide universal significance through a singular claim on meaning-making. Instead, such a method works toward the production of “a reconception (rather than a mirror image) of the universal itself—not as a transcendence of, but as constituted precisely through, various particulars,” as Mrinalini Sinha put it in her 2013 essay “Is ‘Region’ Still Good to Think?” (Comparative Studies of South Asia, Africa and the Middle East). In other words, precisely in the way Compagnie O’s work draws on the details of a unique context, it is able to reach out toward other particular contexts. This is, for this diasporic subject, the potentiality that lies in the universal. Sameness is not necessary for comprehension, only attendance—and attention—is.